Paleo carrot cake with vegan “cream cheese” frosting for a grain-free, refined sugar-free dessert! You’d never guess this moist, decadent cake is healthy! Alternatively titled: The Best Damn Carrot Cake You Ever Did Eat. Carrot cake. Do you have preferences? My guess is the first thing that pops into your head when you think about your ideal carrot cake is whether or not it has pineapple. Whether or not it includes shredded coconut. Whether or not it’s studded with walnuts. Do we dare bring up the topic of raisins? I’m getting heart palpitations just thinking of all the colors of the carrot cake. With so many options available to you, Zen and the Art of Carrot Cake Making may as well be its own institution. I used Bob’s Red Mill Super-Fine Almond Flour to prepare this cake. I have found the combination of fine almond flour and tapioca four to yield the fluffiest grain-free treats. 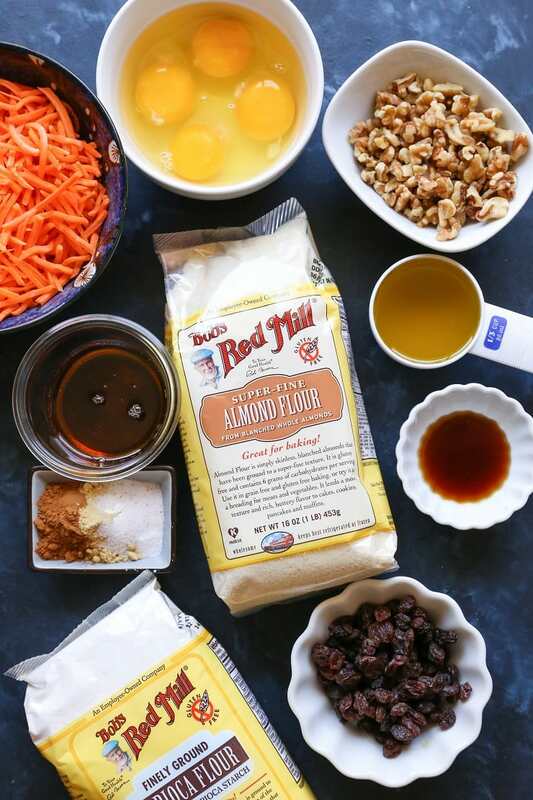 Dating further back than this iconic recipe for Almond Flour Pancakes, BRM’s almond flour has been my go-to for years. You can’t even tell this cake is gluten-free, not to mention grain-free and paleo! Check it: I like making cake batter in a blender. Simply add all the ingredients for the cake except the walnuts, raisins and carrots to a blender. Blend until smooth, then fold in the walnuts, raisins, and carrots. Divide the cake batter between two parchment-lined spring form pans, then bake! Once the cake has cooled, you can frost it with the vegan cream cheese frosting. I recommend preparing the frosting the day or night before to cut down on some of the prep. Note: for those of you who prefer using a stand mixer or mixing bowls to prepare your cake batter, feel free to take that approach! Should you end up with leftovers, you can either store them in a sealed container in the refrigerator for up to 1 week. After about 5 days, the cake will begin to dry out, so if you can’t get through the cake in 5 to 7 days, you can freeze it! Simply wrap the cake securely in plastic wrap then stick it in a zip lock bag, and freeze it. I like to wrap in plastic wrap AND put it in a zip lock in order to ensure the cake doesn’t get freezer burned. My nightly routine lately has been enjoying a thick slice of this cake with a steamy mug of ginger tea while watching How to Get Away with Murder (<- have you seen it??!!! I’ve never been so sucked in to a TV show in my liiiiifeuuuuuuh!). This cake isn’t as sweet as your run-of-the-mill carrot cake. For me, it’s the perfect sweetness, but you can 200% add more pure maple syrup, or erythritol/xylitol to further sweeten it. My intentions for you and the cake is to share it with your family on Easter. 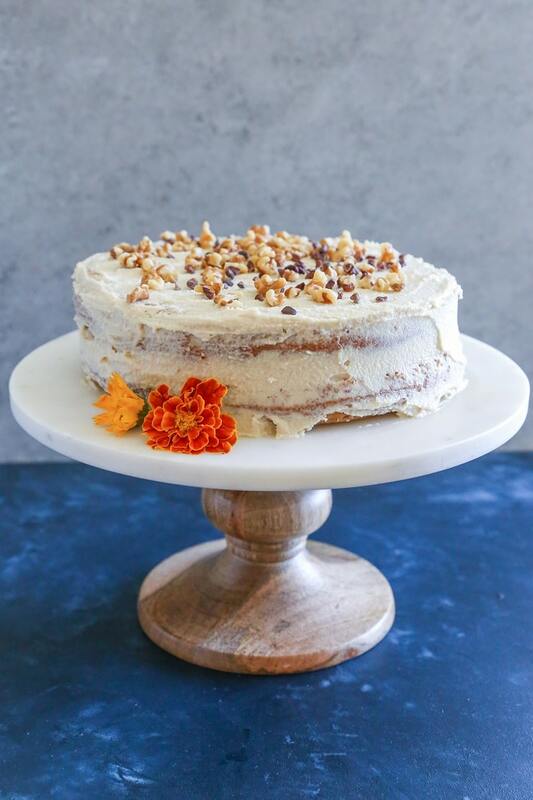 But make no mistake, I’m a year-round carrot caker (hence the carrot cake + HtGAwM seshes), as well as a dessert hogger, so if you feel compelled to bake this gorg thing for your onesie on any given Sunday, you do you like you’ve never done you before! Add 1/3 cup of crushed pineapple (get the canned kind that’s stored in juice, not syrup) and omit the oil. 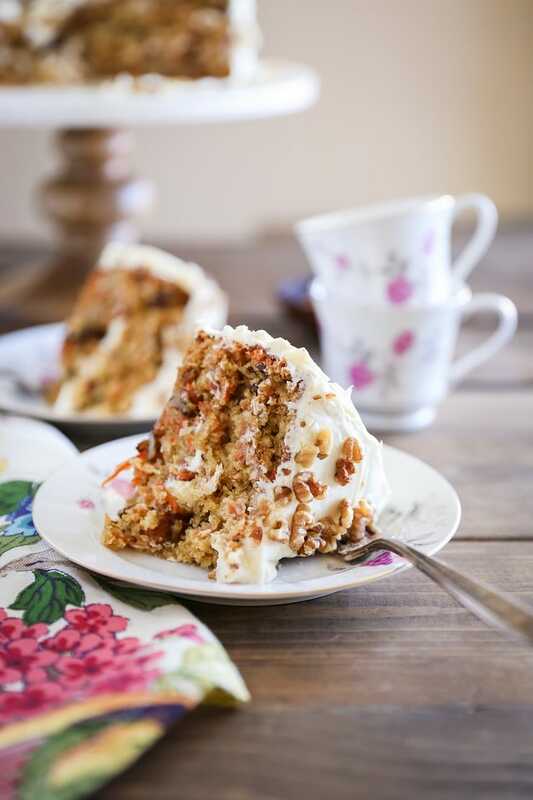 Use a combination of carrots and parsnips – I used parsnips in my Grain-Free Carrot Cake recipe a couple years ago, and it turned out marvelously! Make it vegan by following my recipe for Grain-Free Vegan Carrot Cake. If you’re not into the 2-tier action, you can bake the cake in a single layer in a 13″ x 9″ baking dish. 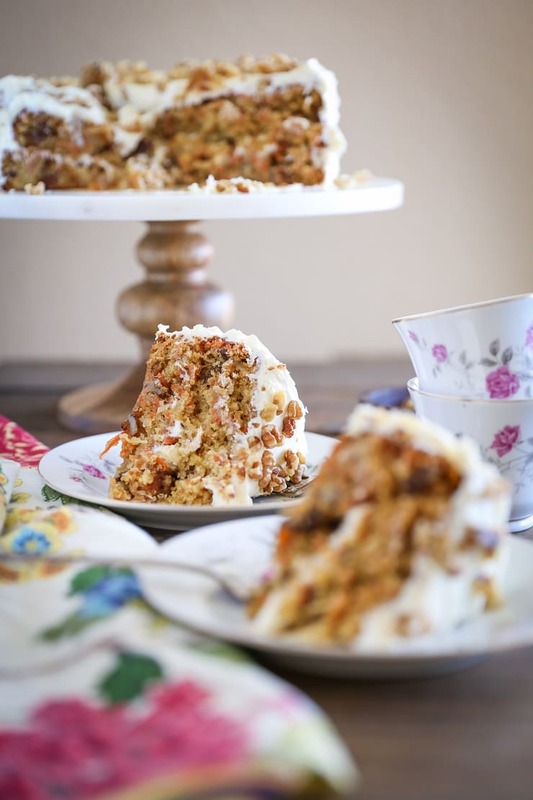 Make your super tender, moist, fluffy perfectly textured paleo carrot cake for your every brunch gathering. Preheat the oven to 350 degrees F and line two 8-inch cake pans (or spring form pie pans) with parchment paper. Add all of the ingredients except for the walnuts, raisins, and grated carrot to a blender or food processor and blend until combined. Add the walnuts, raisins, and grated carrot and fold into the batter until well-combined. Divide the cake batter between the two cake pans and spread into an even layer. Bake on the center rack 20 to 25 minutes, or until cakes are golden-brown and test clean when poked in the center. Allow cakes to cool 15 minutes, then release them from their pans. Allow them to cool an additional 20 minutes. Place one of the cakes on a cake stand or large plate and frost the top with Vegan Cream Cheese Frosting. Place the second cake on top and frost the whole cake with the remainder of the frosting. Garnish with chopped walnuts and cacao nibs, cut into thick slices, and serve! *You can also use olive oil, almond oil, algae oil, etc. **I used pre-grated carrots, but you can also chop up whole carrots and toss them in your food processor to quickly grate them. This looks AWESOME! I love carrot cake and several family members don’t eat gluten; I’ll have to make this for them. Have a great weekend Julia! Thank you, thank you, thank you!!! I’m making this for Easter!!!! Me again ???? I’d like to cut into bars…could this be made in an 8×8 pan? Nope, I’d never know this was a “clean” cake by looking at it — it looks super moist and fluffy and PERFECT. I love coconut in my carrot cake and love toasted walnuts or pecans on the outside, and besides that anything goes. You did a bang-up job on this carrot cake! I LOVE carrot cake. Love the healthier version, I’m am definitely all about this cake! You are the best! W are traveling in our RV. I have all the ingredients, except for a cake pan! Out to get one and this baby is getting made! Thank you. Girl, you always know how to make me drool! 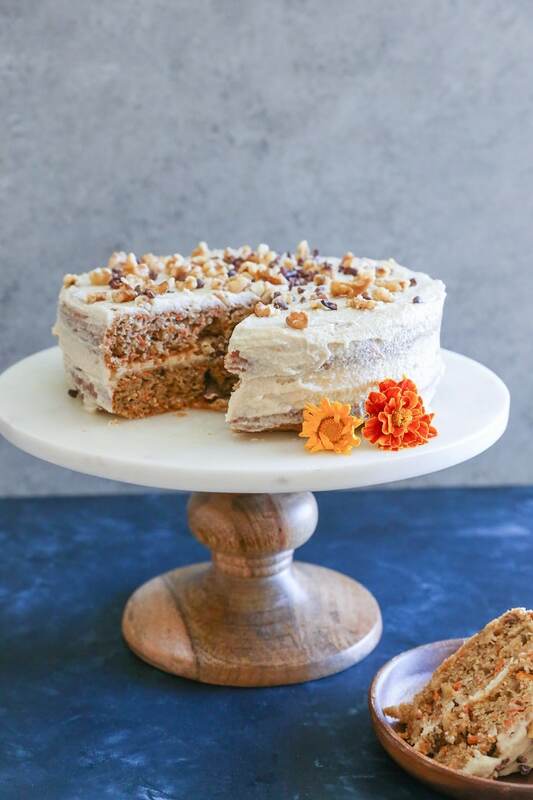 Carrot cake is in my top 5 for favorite desserts and I love that this version is dairy-free and healthified. I also appreciate your choice for add-ins because I am not a fan of pineapple in my carrot cake. But raisins and walnuts are totally my jam. Looks so good! 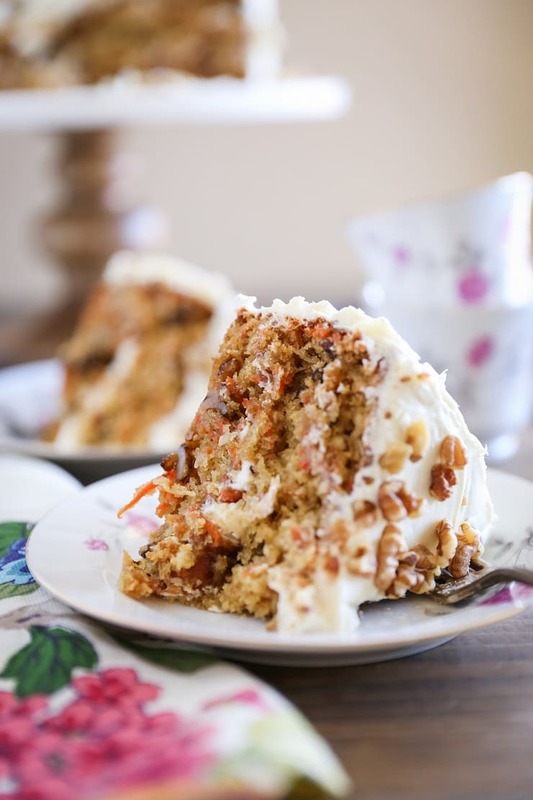 My husband ranks carrot cake as one of his favorite birthday confectionary indulgences. Although I avoid sugar and all but a few carbohydrate sources (ketogenic lifestyle) I excitedly decided to try my hand at baking with almond flour for this occasion. This recipe is simply incredible. Thank you for sharing this for so many of us to enjoy. Our house guests (very typical Standard American Diet, “S.A.D.”) were so impressed with this cake. I used a different brand of almond flour, substituted avocado oil in place of grape seed oil, and omitted the ginger. I made an exception to my avoidance of sugar as the maple syrup was tapped from my aunt’s Vermont Maple trees which made the recipe even more fun to whip up! I greased the round pans with coconut oil as well since I do not routinely bake with parchment paper. Additionally, I added a block of cream cheese to the frosting recipe because none of our guests are vegan; this worked quite well even though I would have liked to follow the frosting recipe as written…it’s just that my guests are used to their “S.A.D.” tastes and textures. I tasted the frosting prior to adding the cream cheese and I think it was very close to a traditional cream cheese frosting, but I noticed the fresh squeezed lemon was somewhat overpowering. In the future, I may swap out the maple syrup for a keto approved sweetener. Pingback: 25 of the Best Paleo Carrot Cake Recipes - My Favorite Cake! My husband LOVES carrot cake and gave this an AMAZING report! He is trying to eat healthier but also have a little bit of ‘sweet’ to enjoy. This was absolutely perfect! He said is was even ‘restaurant worthy!’ Since it is just my husband and me at home now, I decided to cut this recipe down and make just 1/4 of the recipe. I baked it in two ramekins to make a mini-cake that was just the right size without having too much leftover for days which would be sooooo tempting to eat! Thanks for this great recipe! I love this carrot cake recipe. It’s delicious. 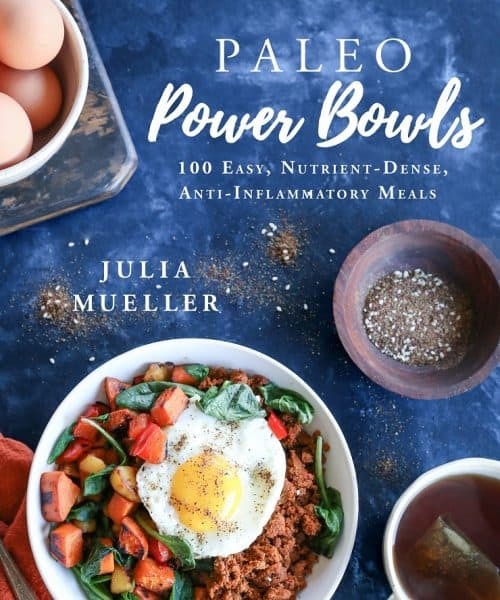 Julia, can you offer any tips for how to modify this recipe to leave out the coconut? I’m planning to make this cake for a friend who loves carrot cake for her birthday, but she does NOT like coconut. Do you have any recommendations? Thank you! 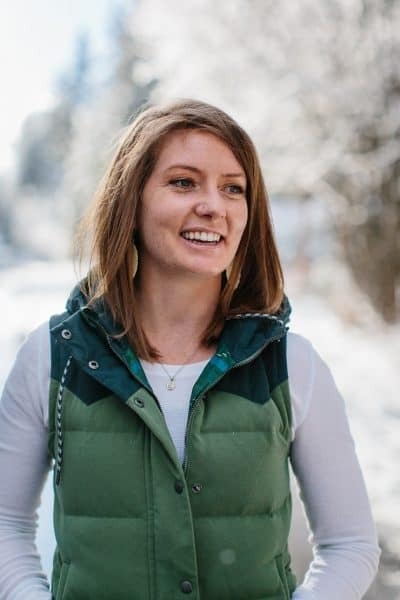 Hi Elizabeth! I’m so happy you like the carrot cake recipe! It’s one of my favorites, too! I would just leave out the coconut. If you’d like, you can add just a little bit more carrot to make up for some of the volume, but I wouldn’t be too concerned about omitting the coconut. Hope your friend loves the carrot cake too! what can you use to replace eggs? 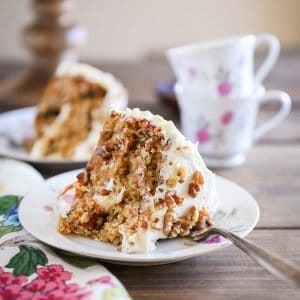 You can use this recipe instead for a vegan version: https://www.theroastedroot.net/grain-free-vegan-carrot-cake/ 🙂 Hope you enjoy! What could I replace the maple syrup with that would make it “very” low to zero % glycemic Keto friendly? I often use stevia drops or pulverized Xyla as sweetenerrs. for baking due to health issues regarding high glycemic sweeteners. Thankyou for this recipe btw!!. You can definitely use stevia, xylitol, or erythritol to replace the pure maple syrup. You’ll need to compensate for the loss in liquid, so I’d add some coconut milk to offset the loss. Hope you enjoy! Ahh the coconut milk replaces the lack of liquid sweetener.That is the info I was seeking. Thanks so much!! I had never tried or had any reason to try making a dairy-free, grain-free cake before but I’m so glad I took a chance on this recipe! I didn’t doubt Julia because she has never steered me wrong before but I will stop hesitating to make try these types of baked goods in the future. This was an easy and DELICIOUS carrot cake! It is super light and airy and so darn satisfying. I will be making this again, and soon. Thank you Julia! I just made a small batch of this to test for Easter and it’s absolutely amazing! I love that it isn’t overly dense like many grain free cakes are. The only think I want to fix before Easter is its lack of sweetness. It wasn’t as sweet as I would like my carrot cake to be, so do you have any suggestions for how to make it sweeter without adding refined sugar or altering the texture of the cake too much? Can I sub the tapioca flour for anything? We recently discovered my son has a potato/potato derivative food intolerance and the list of foods to avoid our ND gave us includes tapioca & arrowroot. Thank you! This looks amazing!! I am going to make it for Easter, thank you. Quick question. Can I blend this in my Kitchenaid instead of in a food processor? Or does it need to be pureed? Thank you! This was a great recipe! I made it with pineapple chunks, no oil. Unfortunately, I couldn’t divide the batter between 2 8′ inch pans. I just didn’t have enough batter to spread across both pans, so I just used 1 8′ inch pan. I baked it for 37 minutes. I skipped the frosting and yet, the cake was great. It was not overly sweet however, it had the moistness (carrots/coconut), crunch (walnuts) and the subtle natural hint of sweetness from the raisins. We baked and ate it on Easter Sunday, but I am thinking it will taste even better next day. Thank you for sharing this recipe. This looks delicious! Can I sub arrowroot powder for the tapioca flour? Also, if I swap the pineapple for the oil, should I drain it first? Do you have nutritional info for a serving? Thanks! hi julia, I just made it today. I hv browsed this recipe few years ago, but did not make it. today I did and I did not regret it. it is so fluffy and moist. I love it. since it is only me eating it, I make 1/4 of d recipe and have 2 cute bake glassware just nice for 2 person. but I ate it all. going to bake again tomorrow but without d oil. if I replace oil with homemade unsweetener applesauce, will it change d texture n taste? I use applesauce to replace oil in another choc cake recipe and d texture n flavour changed. hi julia, just made it for breakfast today. I used my homemade applesauce and replaced it with oil with same ratio. I halved d 1/8 cup of maple syrup and add d other half with water. ( note : I use 1/4 cup of d recipe) . The cake texture is not fluffy like yesterday, but dense. sweetness is nice because d raisins is already sweet. d taste is 1/2 similar with using oil. maybe because very little oil is used in this recipe. to be honest, I prefer the texture and taste of the cake using oil. applesauce make the texture denser and it definitely ruined the paleo choc cake I baked previously.